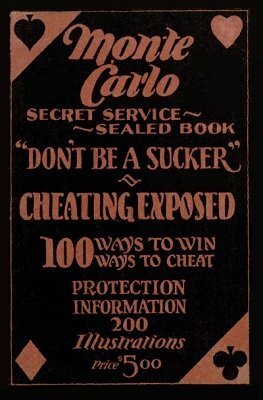 This manual exposes cheating at gambling of all kinds including more than 100 methods of rigged machines, tables, dice, marked cards, sleight of hand and more. It is unclear when this book was originally published, but it does reprint some illustrations from The Expert at the Card Table which means it must be after 1902. Our best guess is that this was published during the 1920s. The lack of knowledge on any one subject is not ignorance. You may be the smartest lawyer, the most brilliant doctor, a captain of finance, an intelligent banker, an educated scholar, and a gentleman in every walk of life, and still be a sucker in a poker game on an ocean liner with three other seeming gentlemen. You would not go into a dynamite works or laboratory where they manufacture and compound dynamite, pick up a mixing bowl, grab a scoopful of this and a bucketful of that and start to mixing it together. No, those in charge, the management, would not let you. You would not walk into an electrical central station and start to throwing switches and levers. No, the management would not let you. Because you know nothing of dynamite or electricity. But you will, and do, walk into a gambling joint with all the ego, pomp, splendor and assurance of a braying jackass. You can mix all the compounds, throw all the switches and levers you want to here because THE MANAGEMENT WILL LET YOU, because you know nothing about gambling, swindling, cheating, the percentages in favor of the banker, the tricks and methods, devices, schemes and plans whereby the gambler wins and the sucker loses.